As the obtuse cliché goes, ‘sports reflect society’ and diligent sports scholars highlight ‘socially significant’ issues. Granted, in some instances sporting practices do reflect society and sports-related research may yield results that have societal significance (for what it’s worth). But the popularity of the cliché in this century can only be explained by its adherents’ underdeveloped self-esteem. Academic interest in sports should no longer be justified by cheap posturing. As I see it, sports studies ought to be carried out for the sake of sports studies. Having spent the latter half of the Christmas Season in Sweden, however, I feel tempted to rehabilitate the good old cliché. Also, I wish I would have been astute enough to pay more attention to ice hockey much earlier! Our family visit coincided with the annual World Junior Ice Hockey Championships. Hosted by Canada, the tournament comprised eight teams from two continents, and the Swedish media of course expected their own team to vie for medals with the three or four other countries in which ice hockey is a truly popular sport. 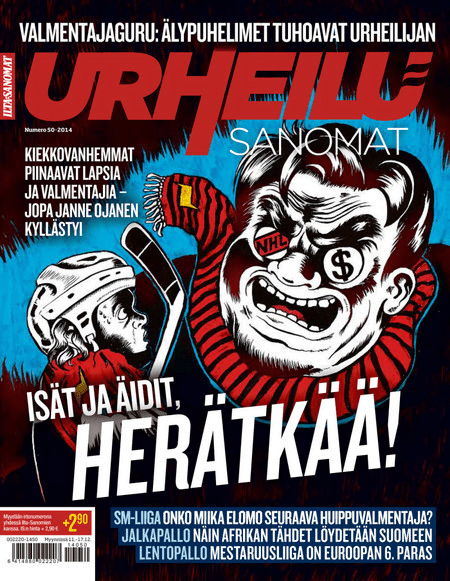 Unsurprisingly, the tabloids were positively obsessed with the prospect of Swedish players becoming ice hockey millionaires. Which boys would be so lucky as to be drafted into the National Hockey League (NHL) this year? How much could they earn in their rookie season? How many millions would they end up making in the course of their professional career? And the people concerned were, as the tournament title implies, basically schoolboys with more experience about skating than shaving. a) foul-mouthed parents abusing their offspring as well as coaches, b) money-hungry parents dreaming of NHL paychecks on their children’s behalf, c) reasonably affluent parents seeking to become seriously rich by offering bribes to coaches, d) plain murderous parents issuing death threats to uncooperative ice hockey bosses (‘Mums and dads, wake up!’ Urheilusanomat 50/2014). My summary is by no means exhaustive. Nonetheless, it appears that ice hockey mores faithfully reflect those of our late capitalist society in which the value of human life is a matter of sheer economics. I rest my case and keep marveling at the social significance of ice hockey studies. Previous Post Jag förknippar backhoppning med de fattiga i Rumänien Next Post Ein Prosit, Der Gemütlichkeit!